The trilogy is FINALLY complete! 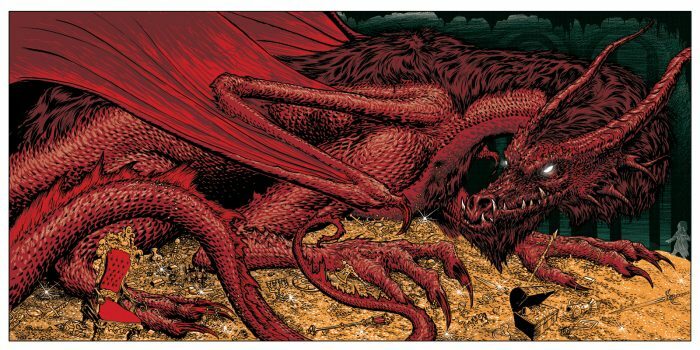 “The Burglar”- the final print in artist Mark Lone’s 3-piece set is now on sale on Nakatomi HERE! 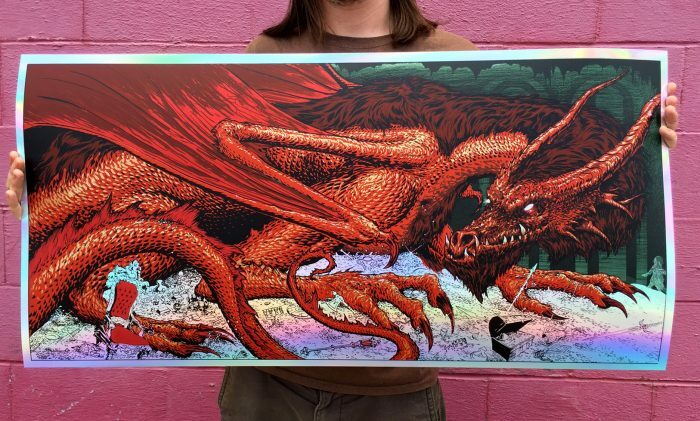 This beautiful 18×13 hand-printed silkscreen poster features metallic gold ink on the treasure hoard! It’s really a stunner in person, and we couldn’t be happier with how it turned out! This foil paper skews to the warm end of the spectrum when the light hits the surface just right, giving the treasure and eye a writhing, living feel to it. It’s quite stunning once you get your hands on it. Note- the foil is NOTORIOUSLY hard to photograph, as it’s essentially a mirror! Prints are available for purchase NOW in the ART PRINTS SECTION of the Nakatomi store HERE.